You'll be £25.00 closer to your next £10.00 credit when you purchase Southern Railway Gallery. What's this? Southern Railway Gallery is the first volume in a new series of picture books, designed to be of interest to railway historians and modellers. The series subjects are themed to include an interesting mixture of useful historic illustrations, depicting locomotives, rolling stock and infrastructure. Southern Railway Gallery covers the history of the Southern Railway from its beginings in 1923, to nationalisation in 1948, covering most aspects of its fascinating history and operations. The book looks at aspects of the Southern from the early years in the early 1920s, when the company had old worn-out stock on many of its lines, through to the introduction of new modern rolling stock and the electrification of much of its network in Kent, Sussex, Surrey and parts of Hampshire. The company owned and operated docks and harbours throughout its existence, having an extensive fleet of ferries and cargo vessels, some of which served with the Royal Navy in the Second World War as hospital ships. The Southern, also operated bus and road services, which covered many areas not served by a local railway station on the system. 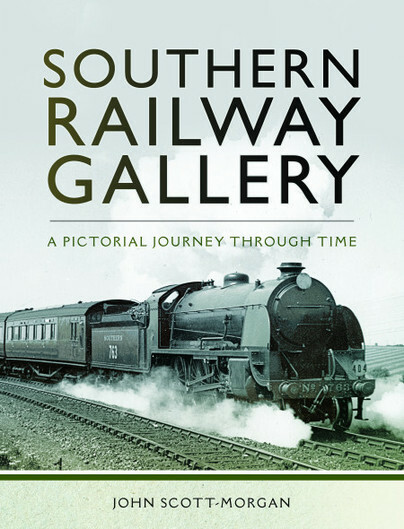 As th very title suggests, this photographic book certainly gives a fascinating glimpse of the Southern Railway in its heyday with many of the well produced photographs not previously published and, for this reason alone the book is a must for all Southern Railway devotee's. A decent delve into the archives and high production values and informative captions add up to an all-round quality picture book worthy of a place on anyone's bookshelf. An interesting book and a fascinating visual archive.